I left a bit of my soul on the Western States trail. It's been a just over a year since I finished my 2nd Western States 100; a little more time than was needed for my psyche to (mostly) recover from my race experience. Seemingly as well-orchestrated as my training plan, the weather and course conditions had also been hard at work. Relentless winter storms repeatedly dumped snow 5 and 10 feet at a time throughout the Sierra Nevada. 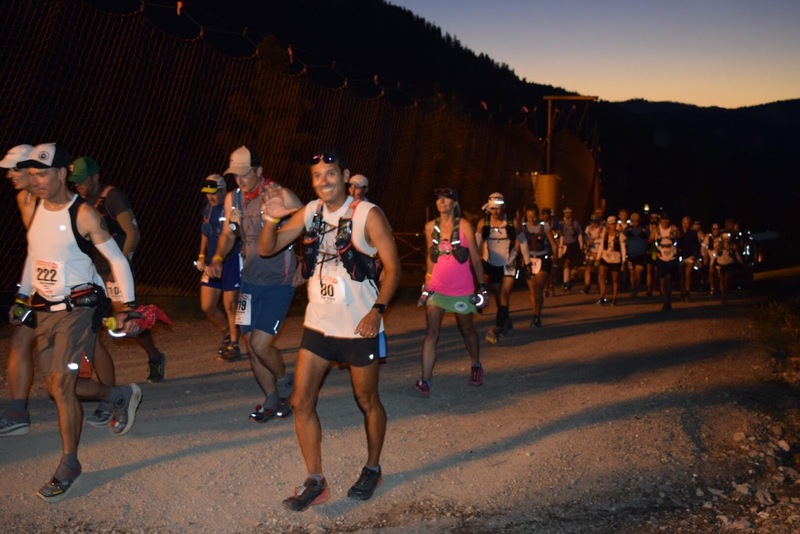 As close as 2-3 weeks out from the race it was still unclear whether or not the course would require a re-route for snow (which threatened to render aid stations inaccessible). 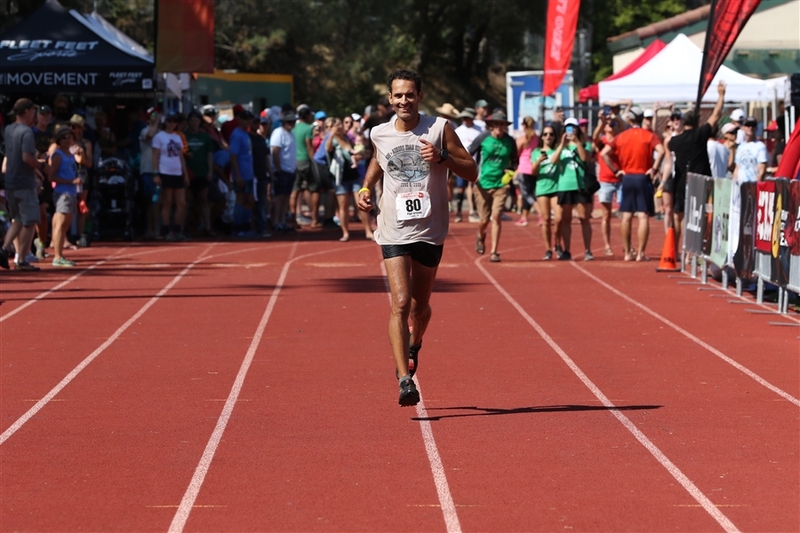 As the last weekend in June approached, the chatter among runners shifted from snow to the epic heat wave that had descended upon Northern California. 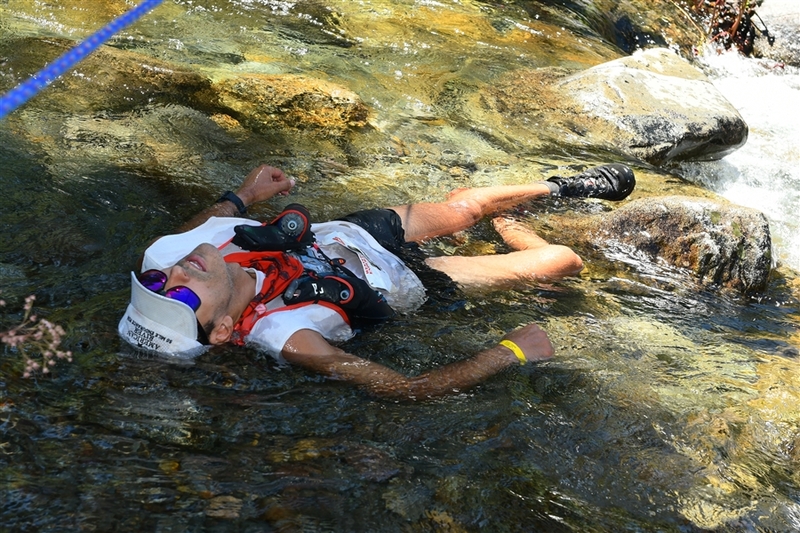 High temperatures in the valley and Auburn area soared to 105-110+ in the days leading up to the race. The rocks and walls of the canyons had heated like a brick oven and were waiting for us. 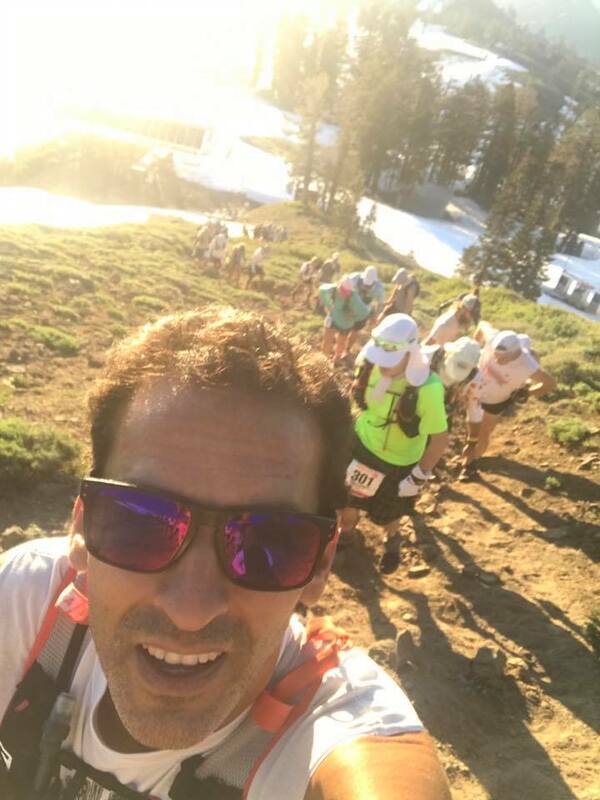 On race day we would encounter miles of snow, even more miles of terrain that had been covered by snow maybe 6-8 months, and as has been the case for many a Western States 100 runner, we would encounter oppressive heat. Not what you want to see during WS race week. Previewing the early miles with my family & friends. Antonio Rossmann reading his 1986 LA Times article at the flag raising ceremony. Is this a race report or a PRE-race report??? JEEZ. I slept well. I awoke at 4 am and marched off to the race staging area. I felt ready to cover 100 miles hours faster than I did the previous year, but was also aware of the reality of the course conditions and heat that awaited and knew to temper my expectations (and my effort/pace early in the race). 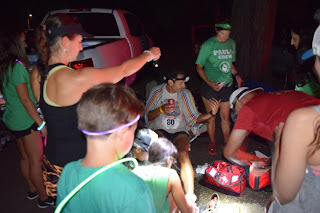 I mingled with my family and crew and made my way to the starting corral. My 2017 Western States 100 was under way. I positioned myself slightly ahead of the middle of the pack and trudged up to 8,750' Emigrant Pass. By the second mile, the rocky trail gave way to a slushy, aged blanket of snow that covered the course and seemingly yearned to say that it had been here too long and wanted to go now. 3 hours after I passed, skiers would be joyfully slopping around on our tracks. Upon descending from the high-point of the course, the high country of the Western States trail greeted us with a reality that was maybe a smidgen more harsh than many of us expected. For the next 10+ miles we slipped, slid, crawled, trudged and otherwise maneuvered over snowfields, through icy streams, up and down rocky trails submerged by ice-cold cascading water, and through freezing, muddy bogs that swallowed our legs midway up our shins and regurgitated our feet and shoes, covering them in mud, rocks and decomposing pine needles, bark and twigs. I squat-skied down steep snow fields and wrestled the course on all fours to avoid sliding into tree wells. At mile 17 it was getting hot and I began to pack snow from the last drifts I would encounter into my pack to stay cool. I was aware that the course was taking a heavy toll on the field of runners. 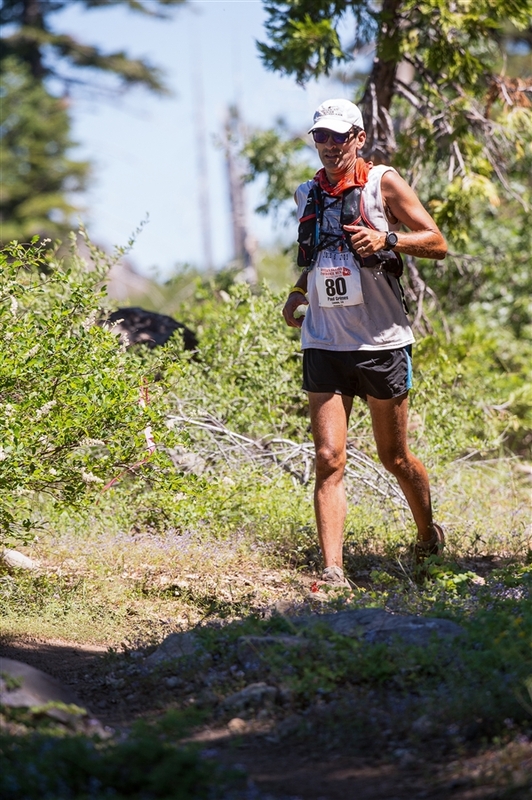 I saw several drops at Red Star Ridge and I was running among and even passing some people who I knew should finish hours ahead of me. I was feeling good, was making great time and decided to back off the pace until Robinson Flat. 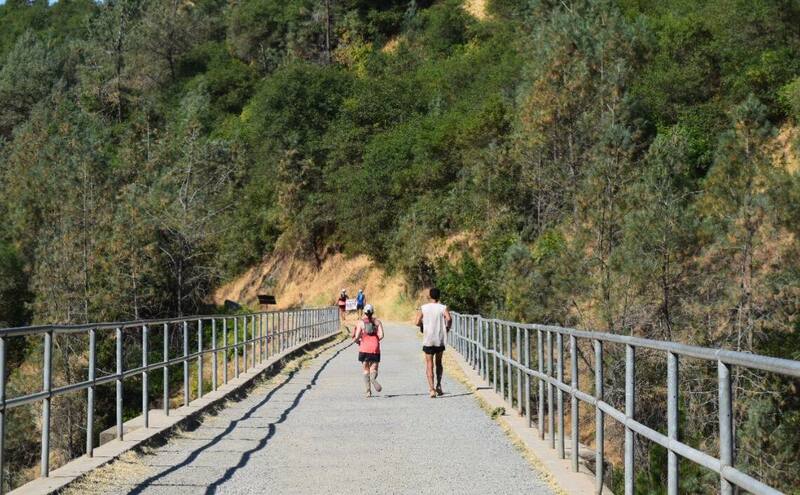 I ran a comfortable pace through Duncan Canyon and after a nice long soak in DC Creek, I drug myself up the hot, relentless, exposed climb to Robinson Flat. I arrived there ~30 minutes sooner than the previous year and feeling much better. The day was already starting to feel long and I was thrilled to see Jen, Kristina, Charito and Lisa (best crew EVERR). They had my nutrition and gear all lined up and smothered me with a lovely iced towel while I re-upped for the canyons. It would be a long, hard 25 miles until I saw them again. Mandatory cool off session in Duncan Canyon Creek. After leaving Robinson, I was feeling good and having survived the mess in the high country well enough, decided to go ahead and test my fitness against the canyons and the heat of the day. 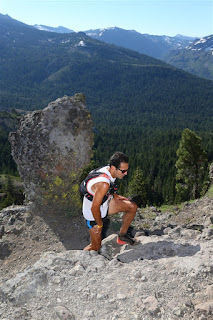 I cautiously pushed the pace through the Western States Downhill 1/2 Marathon (~miles 32 to 45). Nothing crazy, but I averaged ~11 minute miles for this stretch and arrived at Last Chance (mile 43.3) nearly an hour ahead of my previous year's time. This was more fun than a barrel of monkeys, but things were soon to change in my life. Shortly beyond Last Chance as I began the steep drop into Deadwood Canyon, I was bludgeoned with what must have been the hottest, soupiest batch of this Earth's atmosphere I have ever encountered (OK, maybe not as bad as that time I ran a mile into Death Valley's Badwater Basin on a 122 degree day), but rest assured it was GDFN hot. Somewhere around Last Chance on a warm day. After having descended through a furnace to the bottom of Deadwood Canyon, soaking for a few minutes in a stream that crossed the trail and lumbering up the 1.6 mile, 1,600 ft. climb up to Devil's Thumb, definitively I no longer felt like I was prancing through the woods on a magical journey to Auburn. 400 meters from the Devil's Thumb aid station, I slumped over on the trail, hands on my knees, willing myself not to vomit all over the place. I had been battling the planet for 48 miles and nearly 13 hours. I slowed tremendously during the climb to Devil's Thumb and I stumbled miserably along the 5-mile descent to El Dorado Creek, continuing to struggle with nausea. I arrived at Michigan Bluff, mile 55 at ~8:40 PM, the time I had hoped to reach Foresthill (6.5 miles further). Thus far my day had been tremendously long, overwhelmingly difficult. I had grown weary. I was sick. I was frustrated, feeling I had not been given a day to truly test my potential against the course. I had done this already and had nothing to prove. It made no sense to be out here, to continue, to needlessly suffer. My journey had grown bothersome. 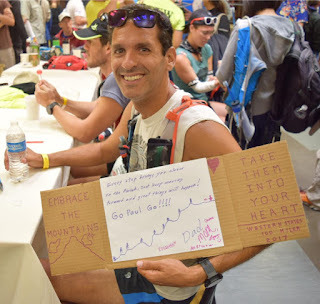 For the first time in well over 100 endurance events I've completed, the thought entered my mind. I could stop. That idea survived in my mind about as long as the flame of a match dropped in water. I remembered my training, the months of focus, honing my ability to overcome anything this day could throw at me. 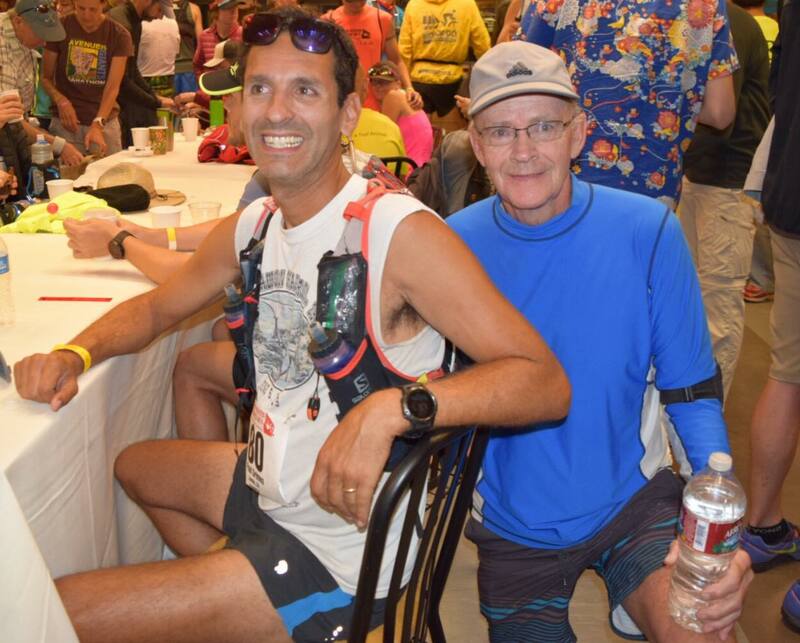 I scoffed at the idea that I, given a chance to run the race of a lifetime two years in a row would quit because I didn't feel like it. 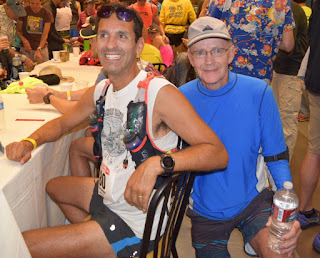 I thought of several friends who were behind me on the course and would not make it or who had missed cutoffs and were pulled from the race hours ago. I thought of how they would give anything to feel as horrible and shattered as I, but still be in the race. I made it to my crew, to my salvation, to my family, who drove and waited for hours and miles, navigating traffic and heat and irritating parking accommodations and shuttle services to see me. To help me. To aid me in my journey, to my finish, to help fulfill my dreams. I sat in a chair as they swarmed to me, smothering me with calorie options and beverages, shoes and socks, love and encouragement, and a heaven-sent icy cold towel that I needed. I buried my face into the towel and sobbed. I overflowed with frustration, agony, discomfort, gratitude, fear, hope, and determination. I let it all out and let it all go, except for the determination, which I would need. Leaving Michigan Bluff later than planned, I was allowed a pacer. Jen was ready, I didn't have to ask. We set off into the setting sun towards Foresthill. Coming into MB feeling a little defeated. Thank you, tribe. Feeling better now. Foresthill, mile 62, 10:30 PM. Brushed my teeth, took some calories, picked up my man Jerry S, who would accompany me to Green Gate. The nausea that joined my excursion just below Devil's Thumb (and had not yet left) would also join me to Green Gate (mile 80). We traveled down Cal Street frustratingly slow. My legs, hips and feet felt strong, but whenever I tried to pick my pace up, nausea would slow me to a walk, even on downhill sections. The jostling in my stomach brought on by a running motion was too much to handle. I had essentially stopped eating and wasn't drinking much. Thankfully Jerry pressed the issue of calorie intake and persuaded me to try different foods. Eventually I found that veggie broth and Mountain Dew (two things I've never taken in a race) didn't upset my stomach. For the last 38 miles, veggie broth was hard to come by. 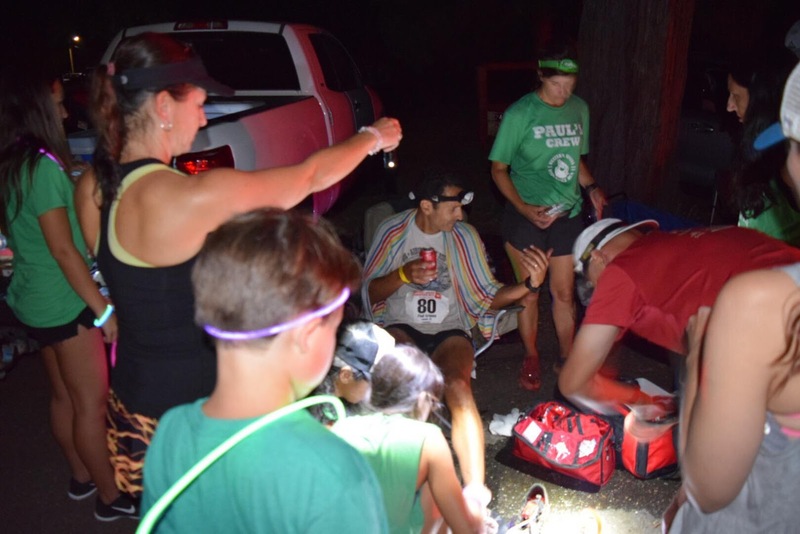 I essentially fueled on ~1/3 can of Mountain Dew at every aid station (every ~5 miles) for the rest of the race. 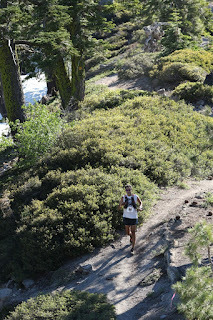 In spite of feeling like hell, I was moving up in the field (passed 28 people from El Dorado Creek to Green Gate) and making good progress towards a finish. Doing the ultra stuff in Foresthill. 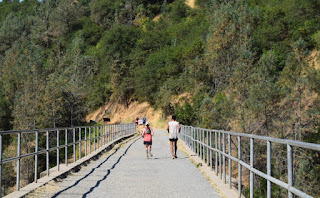 Jerry and I crossed the American River, I changed shoes and climbed to Green Gate. 80 miles down. Rachel was pacing me to the finish. We hadn't run together in a while and it was great to catch up. While climbing up to Green Gate, I had done some bad math and thought I had 5.5 hours to finish, when I actually had 6 hrs 40 mins. I rushed through the aid station and did my best to hustle down the trail with Rachel. Within a mile or so I realized I had plenty of time and eased up a bit. In retrospect, I think the short bout of panic I experienced maybe got my adrenaline pumping and helped cure my nausea! 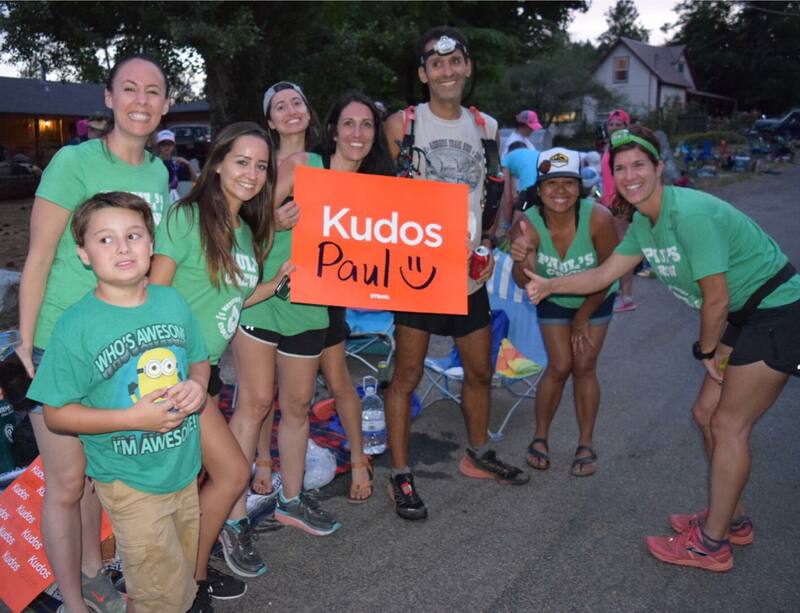 With my nausea gone, the sun up, good company, and legs that felt fresh (as they received a lack of punishment due to my nausea-induced slower pace), the frustration of missing my time goal returned. I popped on some tunes (I think for the first time ever in a race) and was fully rejuvenated. Nothing hurt and running fast felt good. I clicked off 5 miles in 46 minutes, including a sub 8-min mile and a half mile at a low/sub 6-min pace. I burned off some fury and returned to a sustainable pace when I reached the Quarry Rd aid station at mile 90.7. Rachel and I pressed on steadily towards Placer High. We found a turtle and escorted it off the trail. We made it to No Hands Bridge. I knew my second Western States 100 finish was in the bag. Shortly after leaving No Hands I realized I had about 30 minutes to climb ~500 ft and cover ~2.5 miles to finish under 29 hours. One of my goals was to push hard to break any "hour" barrier I could. I went all in and gave it all I had. The temperature had all ready climbed back to 200-300 degrees (roughly). I ran uphill through the heat. I made it to Robie Point and was fired up. 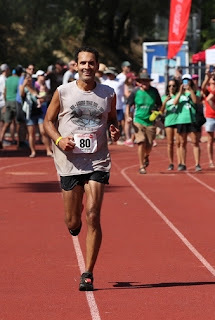 Looking back on my day, I feel that during the last mile, I focused too much on breaking an arbitrary time barrier and did not spend enough time enjoying and celebrating the last mile (fortunately I definitely soaked it all in during my previous finish). When I crested the hill at Robie it was on. I was so happy to see my crew and so many friends and familiar faces, but all I wanted to do was race them to the finish. I pushed just about as hard as I could and had fun doing it. Nothing hurt. I felt like I was running the first or second mile of a 10k race. I crossed the White Bridge and hammered to the finish (7:07 min/mile for the last 1/2 mile according to Strava). We have some catching up to do! 2 Easy Dinner Ideas & Reduced Guilt?! ?